UADM raises money and awareness for children and families being treated at Children’s of Alabama in Birmingham. The group’s efforts culminate in a 12-hour fun-packed event on Feb. 11 at the Ferguson Student Center. TUSCALOOSA, Ala. — Hope — that’s what The University of Alabama Dance Marathon means to 21-year-old Katie Hollingsworth. As a childhood cancer survivor, the UA senior, from Hendersonville, Tennessee, understands more than most the fear and anxiety that comes from living a childhood roaming the halls of a hospital rather than a backyard. Hollingsworth’s story is one of many from the 200 plus students who work all year raising funds and awareness for the children and families being treated at Children’s of Alabama in Birmingham. These efforts will culminate in a 12-hour, no sitting event from 10 a.m. to 10 p.m. Saturday, Feb. 11, at the Ferguson Student Center on UA’s campus. 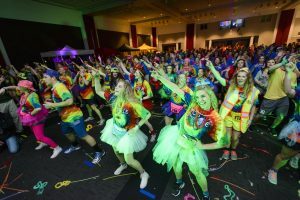 The University of Alabama Dance Marathon is more than just a dance party. It is a celebration for those with childhood diseases who are defying the odds, and it gives UA students an opportunity to dance for those who can’t. In its sixth year on campus, UADM has grown from a small group of passionate UA students who helped raised nearly $15,000 during its first year to a committee of more than 200 students who raised more than $211,000 last year. That, of course, would not be possible without help from sponsors like Love’s Travel Stops and Country Store who provided UADM with a $10,000 grant to help with operations. While the 12 themed hours of nonstop fun is quite appealing to most attendees, the real magic happens at the start of each hour when children and families, known as “miracle children,” share their stories. Those testimonies are the reason UADM exists. “UADM reminds me how lucky I am that I can go to college and be sickness-free and not have to deal with hospital visits and doctors,” said 22-year-old Sara Mond, a senior kinesiology major, from Charlotte, North Carolina, who serves as UADM’s morale co-director. For more information, visit http://www.uadm.ua.edu/.